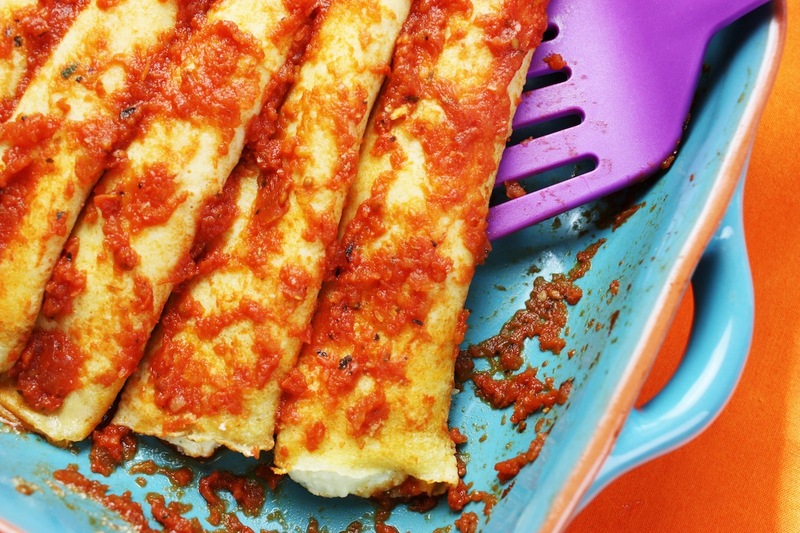 You won’t need teeth to eat this soft and tender manicotti made with crepes. And these are whole wheat crepes! I’ve tried stuffing manicotti pasta – you know, the ones that break when you boil them, and slip and slide when you try to stuff them. It’s easier and faster to make homemade crepes and just roll them up with a simple ricotta cheese filling. This recipe uses two of my other recipes: Crepes and Quick & Easy Spaghetti Sauce. I make the crepes with whole wheat pastry flour. You can use all-purpose flour but trust me, they are beautifully soft and tender made with w.w.p. flour. The best part is that you can make the crepes and sauce a day or two in advance and when it’s time to make dinner you only have to put the easy filling together, roll up the crepes, and bake. You’ll have just enough time to make a salad and some steamed broccoli on the side. The stuffing is a simple combination of part skim ricotta and mozzarella cheeses with parmesan, parsley, and an egg yolk. You can cover them all over with sauce or sometimes I leave the sides bare and put sauce down the center. I’m a big fan of my homemade spaghetti sauce but you certainly can use a bottled sauce if you like. When stuffing and rolling the manicotti, you can tuck in the ends to seal in the filling but I like to leave the ends open and let a little cheese show itself. Plus it’s less work just to roll them up, no tucking. Remember it’s important to have vegetables at every meal so while this bakes for 30 minutes, be sure to take time to make a salad and a cooked vegetable on the side. 4 Comments on "Manicotti that melts in your mouth"
Hi Jenny. I made the manicotti the other night. They were Deeee-lish!!! It was only the second time I made crêpes. thanks to your video….. they were perfect! I check daily to see if there are new recipes and videos. Please keep them coming. This sounds good. I’ll try it. First I need to get a new crepe pan. My old one has had the course. I’ve made some of your recipes, and they all turned out good. This sounds so delicious that instead of having to look up two more recipes, I just combined all three recipes into one and called It “Manicotti w-Spaghetti Sauce and Crepes”. Gave you credit as well…. Have a great week.